Isla Verde is OK for casinos and clubs but hardly offers a sufficient survey of Puerto Rico’s amazing avifauna. The birding centerpiece of our brief Puerto Rican trip was a morning excursion to El Yunque Caribbean National Forest. For a country so blessed with avian diversity, Puerto Rico seemed woefully light in the birding tour department back in 2004. Castillo Tours, a local company, was willing and able to get us to the rainforest but could not provide a guide who knew anything about the native avifauna. This was our loss as we had to overcome the twin hurdles of our own ignorance and inclement weather. El Yunque, which is actually managed by the U.S. Forest Service, is a phenomenal ecosystem, a verdant mountain paradise. The mountain range is named for Yuquiyu, an indigenous rain god. This is apropos because El Yunque is nearly more rain than rainforest. 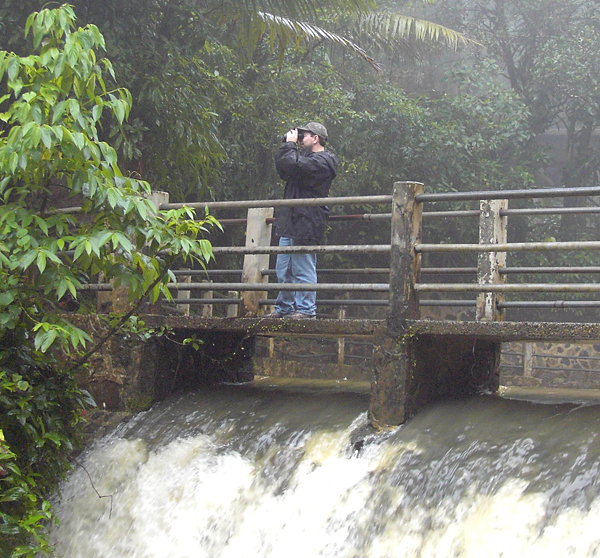 San Juan gets about 35 inches of rainfall a year while El Yunque sees at least 120. Though precipitation is a daily phenomenon above a certain altitude in this region, we were given to understand that the past few weeks had been wetter than most. The rivers rushing down from the mountains were noticeably swollen and fierce as they poured into the ocean. Our guide actually surmised that they might close the park before we arrived due to the oversaturated streams. It might have been better for us if they had. Every tour to El Yunque seems to be a variation on a common theme, one of a limited number of permutations of the same basic activities. If you visit, you will probably be taken to the Yokahu Tower, maybe led to a vaguely interesting pool of water called Bano de Oro, and almost certainly sent down the path to Cascada La Mina, the grand waterfall. El Mina is amazing in the way that waterfalls always are. Much of the fun in visiting it lies in hiking the narrow path cut circuitously into the rainforest that parallels the river as it rushes violently down the mountain. The trail, which descends from 2,132 to 1,640 feet, is long, treacherous, and wild, basically a perfect specimen of its type. However, our visit to El Yunque was marked more by falling water than waterfalls. We began our descent to El Mina in a light drizzle and proceeded to experience the entire spectrum of rain-based precipitation from refreshing mist to modest shower to torrential downpour. To our right was a raging river, goaded to new levels of violence by meteorological overstimulation. 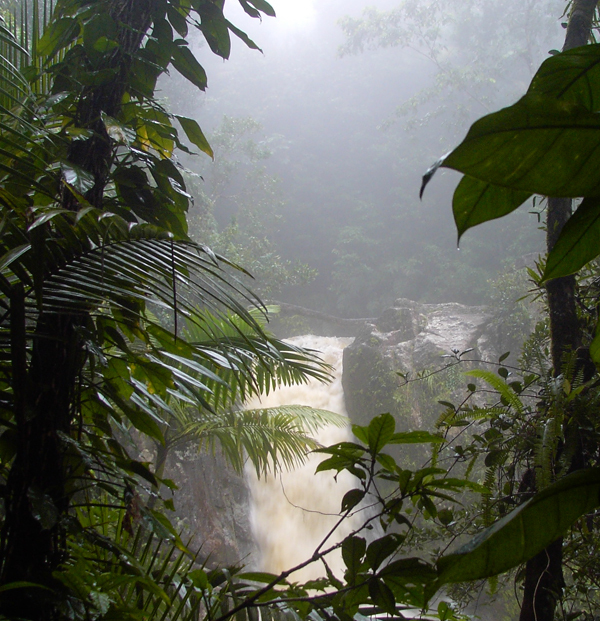 To our left was the sodden rainforest, oozing and dripping excess moisture from every leaf and fissure. Above were the unrelenting clouds and an endless barrage of heavy drops while below was the rushing stream which was once formerly a dry stone foot trail. El Yunque was an immersive experience to say the least. One would think that the birds of the rainforest wouldn’t mind a bit of weather. 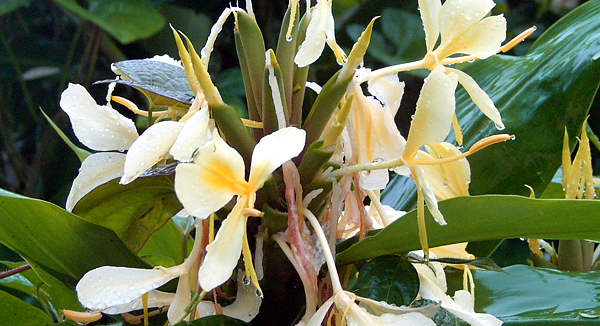 Yet El Yunque’s avifauna made themselves conspicuously scarce during our brief visit. The one bird unafraid to show its bright face was the unabashed Bananaquit. This beautiful little warbler is the national bird of Puerto Rico. It certainly has the personality for the job. The Bananaquit was a veritable ambassador of good will, posing preciously from atop exotic flora at virtually every turn. Equally at home in remote El Yunque and downtown San Juan, this little dynamo showed its black and white striped head and lemon breast everywhere we went. Simply stated, we saw a bunch of Bananaquit and little else. The only endemics we saw during our visit were hummingbirds. Grounded by the unforgiving rain, the wretches we spotted clung miserably to palm trees. The first hummer we saw was a veritable giant, easily 5.5 inches long. This bird, the Green Mango, is common throughout Puerto Rico’s mountain forests and coffee plantations. Its large size distinguishes it from the Puerto Rico Emerald, our other hummingbird for the trip. The plumage of both birds is, as one would expect, dazzling, iridescent green. Unfortunately, under the kind of lighting conditions that attended our first meeting, they show up rather drab. Our final new bird for the trip was that raptor we have sought for so long stateside, the Broad-winged Hawk. El Yunque supports a particularly dark subspecies of the broad wing. We may have missed it at this year’s hawkwatches but we were, at last, able to marvel at this hawk’s namesake appendages. I found it odd that not a single raptor species unknown to the U.S. flies Puerto Rico’s skies, but the Red-tailed Hawk is as dominant there as it is in New York. The Osprey is also common, although it is somewhat incongruous to see the seahawk hunt the Caribbean the exact same way it works the waters off the coast of North Carolina.